BAFTA Games Awards の Game of the Year 2017 にノミネート"
Pelican Town is opening its doors to Mobile devices! 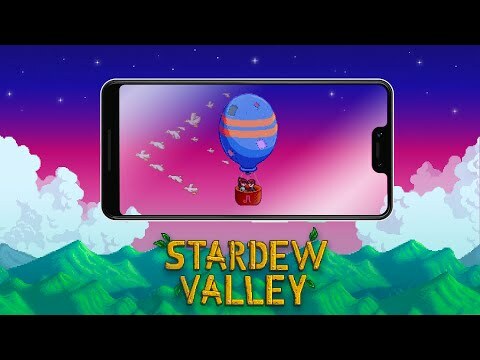 Stardew Valley comes first to iOS on October 24th, with more news on the upcoming Android release soon. Pre-Orders available from October 10th! Created by ConcernedApe, published by Chucklefish. Mobile version developed by The Secret Police. アップグレードした銅ジョウロの水やりで、タップ移動の状態で、連続して3マスの水やりをしようとするときに、水やりのアニメーションが終わらない内に次のマスを長押ししていると、3マスではなく、1マスの水やりになってしまってストレスが貯まります。 In English, while using tap to move setting, when watering plants with upgraded copper watering can, when I try to water plants of 3 tiles in a row, if I long press next tile while not completing current watering animation, I end up watering 1 tile instead of 3 tiles, which is stressful. 拡大率修正に関するバグ、だいぶ直りましたが、妊娠を許可する のトリガー切り替えのアイコンが表示されず、許可しているのかそうでないのか分かりませんでしたが、バージョン1.17で修正されました！(4/8追記) Thanks! it is fixed on release 1.17! (2019/3/23 0:01更新) 投稿した途端、修正してくれた、、ありがとうございます¥u200d♀️星５です。ありがとうございます¥u200d♀️ thanks! please fix↓ 1.cannot see item count! 2.day result display gap! I tryed! re-install (2019/3/22 23:02) (XPERIA XZ2 premium) thanks!